Compass problems are one of the cited phrases in many Triangle incidents. While some have theorized that unusual local magnetic anomalies may exist in the area, such anomalies have not been shown to exist. Compasses have natural magnetic variations in relation to the magnetic poles, a fact which navigators have known for centuries. Magnetic (compass) north and geographic (true) north are only exactly the same for a small number of places - for example, as of 2000 in the United States only those places on a line running from Wisconsin to the Gulf of Mexico. But the public may not be as informed, and think there is something mysterious about a compass "changing" across an area as large as the Triangle, which it naturally will. Deliberate acts of destruction can fall into two categories: acts of war, and acts of piracy. Records in enemy files have been checked for numerous losses. While many sinkings have been attributed to surface raiders or submarines during the World Wars and documented in various command log books, many others suspected as falling in that category have not been proven. It is suspected that the loss of USS Cyclops in 1918, as well as her sister ships Proteus and Nereus in World War II, were attributed to submarines, but no such link has been found in the German records. Piracy—the illegal capture of a craft on the high seas—continues to this day. While piracy for cargo theft is more common in the western Pacific and Indian oceans, drug smugglers do steal pleasure boats for smuggling operations, and may have been involved in crew and yacht disappearances in the Caribbean. Piracy in the Caribbean was common from about 1560 to the 1760s, and famous pirates included Edward Teach (Blackbeard) and Jean Lafitte. The Gulf Stream is an ocean current that originates in the Gulf of Mexico and then flows through the Straits of Florida into the North Atlantic. In essence, it is a river within an ocean, and, like a river, it can and does carry floating objects. It has a surface velocity of up to about 2.5 metres per second (5.6 mph). A small plane making a water landing or a boat having engine trouble can be carried away from its reported position by the current. One of the most cited explanations in official inquiries as to the loss of any aircraft or vessel is human error. Whether deliberate or accidental, humans have been known to make mistakes resulting in catastrophe, and losses within the Bermuda Triangle are no exception. For example, the Coast Guard cited a lack of proper training for the cleaning of volatile benzene residue as a reason for the loss of the tanker SS V.A. Fogg in 1972. Human stubbornness may have caused businessman Harvey Conover to lose his sailing yacht, the Revonoc, as he sailed into the teeth of a storm south of Florida on January 1, 1958. Publications by the USGS describe large stores of undersea hydrates worldwide, including the Blake Ridge area, off the southeastern United States coast. However, according to another of their papers, no large releases of gas hydrates are believed to have occurred in the Bermuda Triangle for the past 15,000 years. Flight 19 was a training flight of TBM Avenger bombers that went missing on December 5, 1945 while over the Atlantic. The squadron's flight path was scheduled to take them due east for 120 miles, north for 73 miles, and then back over a final 120-mile leg that would return them to the naval base, but they never returned. The impression is given that the flight encountered unusual phenomena and anomalous compass readings, and that the flight took place on a calm day under the supervision of an experienced pilot, Lt. Charles Carroll Taylor. Adding to the intrigue is that the Navy's report of the accident was ascribed to "causes or reasons unknown." Adding to the mystery, a search and rescue Mariner aircraft with a 13-man crew was dispatched to aid the missing squadron, but the Mariner itself was never heard from again. Later, there was a report from a tanker cruising off the coast of Florida of a visible explosion at about the time the Mariner would have been on patrol. While the basic facts of this version of the story are essentially accurate, some important details are missing. The weather was becoming stormy by the end of the incident, and naval reports and written recordings of the conversations between Taylor and the other pilots of Flight 19 do not indicate magnetic problems. The mysterious abandonment in 1872 of the 282-ton brigantine Mary Celeste is often but inaccurately connected to the Triangle, the ship having been abandoned off the coast of Portugal. The event is possibly confused with the loss of a ship with a similar name, the Mari Celeste, a 207-ton paddle steamer that hit a reef and quickly sank off the coast of Bermuda on September 13, 1864. Kusche noted that many of the "facts" about this incident were actually about the Marie Celeste, the fictional ship from Arthur Conan Doyle's short story "J. Habakuk Jephson's Statement" (based on the real Mary Celeste incident, but fictionalised). The incident resulting in the single largest loss of life in the history of the US Navy not related to combat occurred when USS Cyclops, under the command of Lt Cdr G.W. Worley, went missing without a trace with a crew of 309 sometime after March 4, 1918, after departing the island of Barbados. Although there is no strong evidence for any single theory, many independent theories exist, some blaming storms, some capsizing, and some suggesting that wartime enemy activity was to blame for the loss. Theodosia Burr Alston was the daughter of former United States Vice President Aaron Burr. Her disappearance has been cited at least once in relation to the Triangle. She was a passenger on board the Patriot, which sailed from Charleston, South Carolina to New York City on December 30, 1812, and was never heard from again. The planned route is well outside all but the most extended versions of the Bermuda Triangle. Both piracy and the War of 1812 have been posited as explanations, as well as a theory placing her in Texas, well outside the Triangle. S.V. Spray was a derelict fishing boat refitted as an ocean cruiser by Joshua Slocum and used by him to complete the first ever single-handed circumnavigation of the world, between 1895 and 1898. In 1909, Slocum set sail from Vineyard Haven bound for Venezuela. Neither he nor Spray were ever seen again. 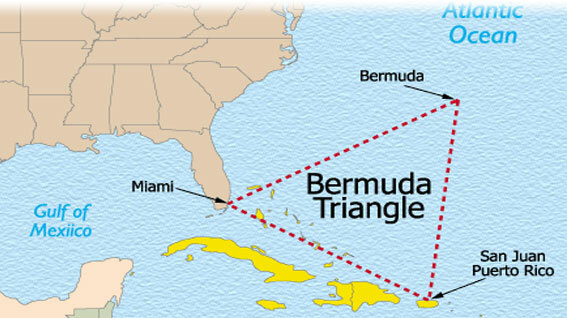 There is no evidence they were in the Bermuda Triangle when they disappeared, nor is there any evidence of paranormal activity. The boat was considered in poor condition and a hard boat to handle that Slocum's skill usually overcame. On December 28, 1948, a Douglas DC-3 aircraft, number NC16002, disappeared while on a flight from San Juan, Puerto Rico, to Miami. No trace of the aircraft or the 32 people onboard was ever found. From the documentation compiled by the Civil Aeronautics Board investigation, a possible key to the plane's disappearance was found, but barely touched upon by the Triangle writers: the plane's batteries were inspected and found to be low on charge, but ordered back into the plane without a recharge by the pilot while in San Juan. Whether or not this led to complete electrical failure will never be known. However, since piston-engined aircraft rely upon magnetos to provide spark to their cylinders rather than a battery powered ignition coil system, this theory is not strongly convincing. On August 28, 1963 a pair of US Air Force KC-135 Stratotanker aircraft collided and crashed into the Atlantic. The Triangle version (Winer, Berlitz, Gaddis) of this story specifies that they did collide and crash, but there were two distinct crash sites, separated by over 160 miles (260 km) of water. However, Kusche's research showed that the unclassified version of the Air Force investigation report stated that the debris field defining the second "crash site" was examined by a search and rescue ship, and found to be a mass of seaweed and driftwood tangled in an old buoy. SS Marine Sulphur Queen, a T2 tanker converted from oil to sulfur carrier, was last heard from on February 4, 1963 with a crew of 39 near the Florida Keys. Marine Sulphur Queen was the first vessel mentioned in Vincent Gaddis' 1964 Argosy Magazine article, but he left it as having "sailed into the unknown", despite the Coast Guard report, which not only documented the ship's badly-maintained history, but declared that it was an unseaworthy vessel that should never have gone to sea. One of the more famous incidents in the Triangle took place in 1921 (some say a few years later), when the Japanese vessel Raifuku Maru (sometimes misidentified as Raikuke Maru) went down with all hands after sending a distress signal that allegedly said "Danger like dagger now. Come quick! ", or "It's like a dagger, come quick!" This has led writers to speculate on what the "dagger" was, with a waterspout being the likely candidate (Winer). In reality the ship was nowhere near the Triangle, nor was the word "dagger" a part of the ship's distress call ("Now very danger. Come quick."). Having left Boston for Hamburg, Germany, on April 21, 1925, she was caught in a severe storm and sank in the North Atlantic with all hands while another ship, RMS Homeric, attempted an unsuccessful rescue. A pleasure yacht was found adrift in the Atlantic south of Bermuda on September 26, 1955; it is usually stated in the stories (Berlitz, Winer) that the crew vanished while the yacht survived being at sea during three hurricanes. The 1955 Atlantic hurricane season lists only one storm coming near Bermuda towards the end of August, hurricane "Edith"; of the others, "Flora" was too far to the east, and "Katie" arrived after the yacht was recovered. It was confirmed that the Connemara IV was empty and in port when "Edith" may have caused the yacht to slip her moorings and drift out to sea. A Cessna piloted by Carolyn Cascio, on June 6, 1969, with one passenger, attempted to travel from Nassau, Bahamas to Cockburn, Grand Turk Island. The plane was witnessed by many air traffic controllers in Cockburn's airport to circle the island for 30 minutes, after which, it flew away apparently for another island. All attempts from the ground to raise Cascio on the radio failed.